There is a saying in the Talmud that it is because of the merit of the women of the Exodus story that Israel is redeemed from Egypt. The women of Passover that this refers to are: Yocheved, Mother of Moses; Miriam, sister of Moses; Shifra and Puah, the midwives; Tziporah, Mose’s Midianite wife; and Batya, Pharaoh’s daughter. In the first chapter of the Biblical book of Exodus, the scene is set for the story of the flight from Egypt. A Pharaoh begins to rule in Egypt, he does not know the generation of Joseph and he begins to oppress the children of Israel. First he enslaves them, but they continue to multiply. The first female characters to appear in Exodus (1:15-20) are Shifra and Puah, Hebrew midwives. The Pharaoh calls the Hebrew midwives to appear before him, and demands that they kill the male children of the Israelites. The midwives refuse his request claiming that the Hebrew women are lively and give birth before they even reach them. This is one of the earliest known acts of civil disobedience. The text is unclear whether they were actually Hebrew midwives or Egyptian midwives for the Hebrews. In either case for them to stand up to the Pharoah was heroic, but if they were Egyptian—it’s astonishing. The next magnanimous female character we encounter is Batya. Batya, or Bithia, was the daughter of the Pharoah himself, clearly Egyptian. Her story appears in Exodus 2:5-10, where she goes to the river to wash. Her father has issued a decree to kill all Hebrew babies, yet her actions contradict his. She is unnamed yet she does such an overwhelming gesture of kindness, i.e. 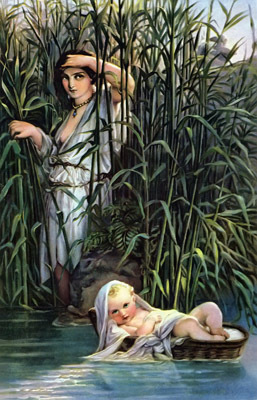 saving the baby, that the rabbis felt compelled to give her a name: Batya, meaning “daughter of God.” By this act of kindness she becomes Divine and sits beside God’s throne handing out blessings. 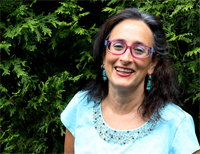 Not only does Batya reach beyond her self, her family, her attendants and her upbringing, but she also stretches beyond her comfort level to become something new—a mother. She adopts and welcomes a child of another background. She opens her heart to raise a child of another faith in her home. She then turns to Miriam to ask her to find him a wet nurse. She knowingly stays engaged with his family of origin. She is a model of welcoming and outreach and the tradition is that when we welcome others by adoption or just hospitality, she blesses us. So here we have six women who are crucial to the saving of the Israelites, yet not all were Jewish themselves! With the exception of Yocheved and Miriam, and assuming the midwives were possibly Egyptians, the Israelites are dependent on a larger context beyond the tribes. Clearly we claim these non-Israelite women as our heroines. Clearly they are part of our story, and clearly they are significant characters in our transformation from slavery to freedom. Then, as today, the survival and health of the Jewish people is not always in our own hands. As we move forward with these stories as our guide and the reality of the many interfaith partners we are embracing along the way, we must appreciate their efforts this Passover season in the ongoing story of liberation and transformation of the Jewish people.